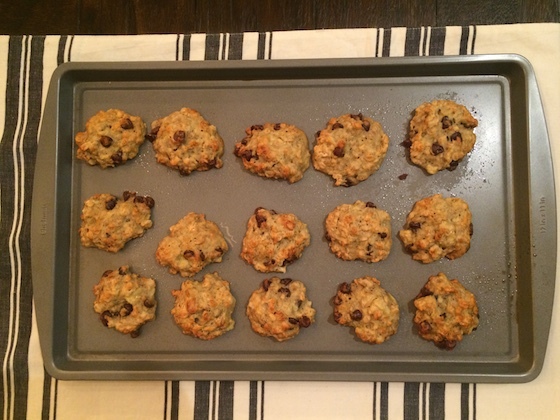 In a daily eats post a few weeks ago I hinted that a recipe was coming for these cookies. I’ve been busy sharing with you a kale salad and pear blondies, but the time has come! These little cookies taste just like banana bread. They’re moist and subtly sweet, made even better by the crispy edges and addition of a few chocolate chips. The ingredient list is stellar, too. They have no refined sugar and are vegan – can you believe it? I love enjoying a couple for breakfast with a big green smoothie, or as my after-dinner treat with some chilled almond milk. I have a few ripe bananas at home, so I’m looking forward to making another batch tonight. Please give them a try, you won’t regret it! Preheat oven to 375°. Grease a cookie sheet. In a large bowl, mash bananas with a fork. Stir in oil, maple syrup, and vanilla. In a small bowl, whisk together flour, oats, flax seeds, baking soda, baking powder, and salt. Stir dry ingredients into wet ingredients until just combined. Fold in chocolate chips. Scoop rounded tablespoons of dough onto prepared cookie sheet. Bake until cookies are set and edges are lightly browned, about 12 minutes.